A sizable majority of U.S. adults use Facebook and most of its users get news on the site. But a new Pew Research Center survey finds that notable shares of Facebook users ages 18 and older lack a clear understanding of how the site’s news feed operates, feel ordinary users have little control over what appears there, and have not actively tried to influence the content the feed delivers to them. The findings from the survey – conducted May 29-June 11 – come amid a debate over the power of major online platforms, the algorithms that underpin those platforms and the nature of the content those algorithms surface to users. Facebook’s broad reach and impact mean that its news feed is one of the most prominent examples of a content algorithm in many Americans’ lives. Facebook offers a number of tools to help users customize the information in their news feed. But just 14% of Facebook users believe ordinary users have a lot of control over the content that appears there – and twice that share (28%) feels they have no control. 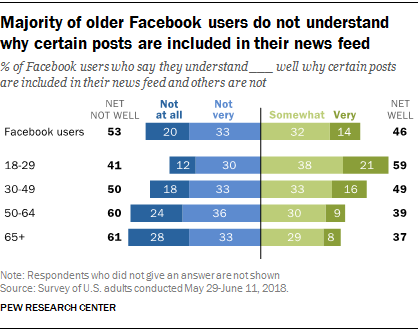 Older adopters in particular feel users have little agency in this regard: Some 37% of Facebook users 50 and older think users have no control over their news feed, roughly double the share among users ages 18 to 49 (20%). Whether or not someone has made an effort to influence the content of their own news feed is often linked with their sense that users have control over the content that appears there. Half (50%) of Facebook adopters who think users have a lot of control over their news feeds have themselves attempted to influence the content they see there. But that share falls to 40% among those who think users have only a little control over the content of their feeds, and to 24% among those who think they have no control. When asked about specific steps they have taken to influence the content of their feed, around eight-in-ten users who have attempted to do so (81%) say they have followed or unfollowed specific groups or organizations. And similarly large majorities say they have indicated to Facebook that they would like to see more or less of certain types of content (76%); have friended or unfollowed certain people (73%); have liked, shared or commented on certain types of content (70%); or have changed their general privacy settings or ad preferences (70%). In total, 39% of these users say they have taken all of these steps. 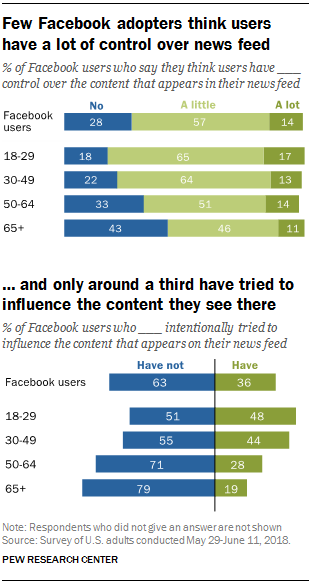 Responses to this question again differ substantially across age groups, as relatively small shares of older users say they have actively taken steps to try and influence their news feed. Some 46% of users younger than 50 have attempted to do this, but that share falls to 28% among those 50 to 64 and to just 19% among those 65 and older.